I spend $10/month to use my Galaxy S4 smartphone. This includes voice, data, and texting service. How? By not signing up for a cellular contract. If you buy your own phone using sites like eBay, craigslist, or Swappa (or if you have a phone from a previous contract), you can use it to sign up for cellphone service through an MVNO. An MVNO (mobile virtual network operator) is basically a company that buys bandwidth from one of the major cellphone companies like AT&T, Sprint, or Verizon, and sells it at rates significantly lower than any contract plan. Many MVNOs also sell phones direct (and some require that you use their phone). Wikipedia has a good list of most MVNOs available in the US. In general, when you buy a cellphone, it's locked to a specific service, An AT&T phone only works on an AT&T MVNO, a Verizon phone only works with a Verizon MVNO, and so on. One exception is if you buy an unlocked GSM phone, then it will work with AT&T or T-Mobile MVNOs. If you buy one of Google's excellent Nexus phones, it will actually work on AT&T, T-Mobile, or Sprint MVNOs (sorry, Verizon). Depending on how you plan on using your phone (heavy vs. light usage, voice-only vs mostly data, etc. ), your best choice of MVNO will vary. If you don't want to do much research, I'd recommend the following as good all-around choices: Airvoice if you have an AT&T phone (like I do), Ting if you have a Sprint phone, Straight Talk for a T-Mobile phone, or PagePlus if you have a Verizon phone. In my $10/month case, I use Airvoice's "250 Minute Plan", and I try to take advantage of Wifi as much as possible, minimizing my use of cellular data to 100MB or less per month. I've signed up for Google Voice, and use it as my primary phone number. That way, texting costs me nothing except a very minimal amount of data (which is free if I'm on Wifi). Google finally updated their Hangouts Android app in the last couple months, so I can now make all of my voice calls using my phone's data connection (again, free over Wifi; or at a cellular data cost which is roughly equivalent to what it'd cost me to call using my voice minutes). I may be able to pay even less, depending on how everything goes with an experiment I'm doing with FreedomPop. I recently scored a free Overdrive 3G/4G hotspot via a deal I found on SlickDeals a few months ago. Theoretically, you could get totally free data every month through FreedomPop. However, you'd have to be in their 4G WiMax coverage area (which is pretty sparse; and will no longer be available after late-2015). So, for a minimum of $4/month, you can also access 3G data, which is available anywhere you can get Sprint 3G. For FreedomPop's lowest-tier service, you get 500MB/month of data, but you can easily increase this to 1GB/month by linking with at least 10 "Freedom Friends". 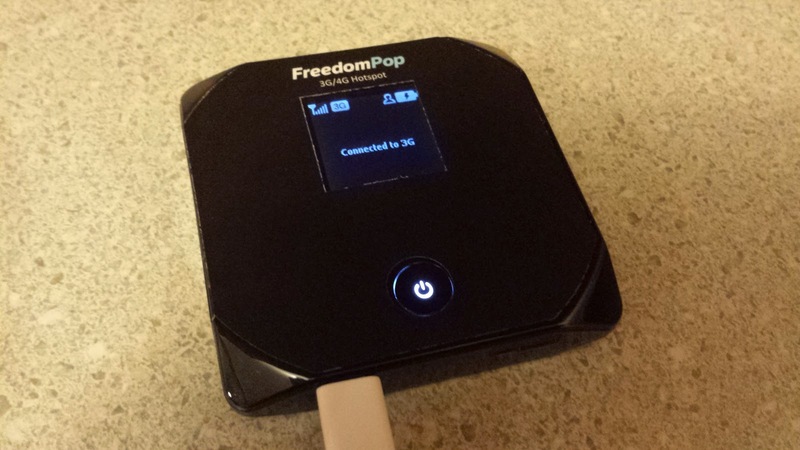 I keep my FreedomPop hotspot plugged into a charger in my car's center console. It actually has a decent range of coverage, and works from the parking lot of most suburban businesses/restaurants while I'm indoors. If I let it go into standby when not in use for 10 minutes, it generally lasts a couple days before I need to bring it indoors and top off the battery. By using a combination of Wifi and my 1GB of FreedomPop data for on-the-go Internet and to make Hangouts calls, I think I should be able to switch to Airvoice's $10 every 90 day plan. This, on top of the $4/month I pay to FreedomPop, would effectively bring my cellphone bill down to $7.33/month. Not half bad.